UA's Apollo interfaces were desirable before but they're close to irresistible now. Thunderbolt 2 connection allows for near latency-free data transfer. Great preamp sound and sumptuous effects processing capability for further sonic enhancement. Apollo 8p's eight onboard microphone preamps. UAD's Apollo range has been slowly evolving since the release of the silver firewire interfaces in 2012. Since that time, the Apollo Twin first hinted that UA, like many of its rivals, saw Thunderbolt as the future of connectivity and, indeed, Thunderbolt expansion cards have been available for the existing Apollo interfaces for some time. But the three new Apollo interfaces in UA's range all feature Thunderbolt 2 connectors as standard, ushering in a new model aimed firmly at the latest line of Apple computers. "For those with a computer to support the capabilities of the new line-up, there's nothing to stop a wholehearted endorsement"
Those interfaces are Apollo 8 (pictured), Apollo 8p and Apollo 16 and all benefit from the capabilities of Apollo Expanded, UA's recently announced system for daisy-chaining multiple interfaces to create ever-expanding, aggregated I/O and increased UAD plug-in counts too. Indeed, don't forget that a huge part of the Apollo concept is to cover both audio interfacing and effects hosting within the hardware itself. As for that hardware, the different Apollo units provide contrasting configurations. The Apollo 8 features four Unison-enabled microphone preamps while the 8p provides the first UA interface with eight onboard microphone connectors on the rear panel. (making the Duo option the cheapest Apollo interface of the new line-up), while the 8p features Quad processing as standard. 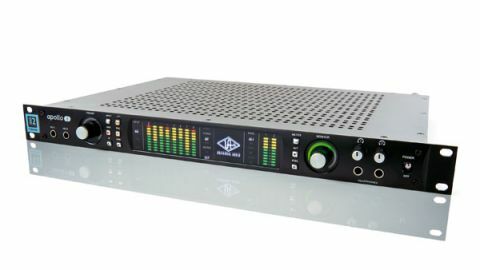 The Apollo 16 offers its I/O via DB-25 connectors, making it the most suitable choice for those wishing to combine high-quality interfacing with an existing console or suite of outboard preamps and, like the 8p, it offers Quad processing as standard. The front panels of the 8 and 8p are set up to let you configure Apollo directly; select an input number, switch between microphone and line sources (or guitar and bass inputs via Hi-Z connectors on inputs 1-2), before using the prominent preamp dial to select gain amount. In combination with UA's own Console 2 bridging application, you can go further, enabling Unison preamp technology to clone the sound of an assortment of vintage channels (or effects pedals for guitarists). You can also use Console to create a stack of Insert effects per channel, set up Auxiliary Sends and Cue Mixes and even create return channels from your DAW, allowing you to upscale from regular audio interfacing to a more thorough and comprehensive audio solution. multiple onstage performers, as well as its appeal to studio-based producers. Thunderbolt 2 provides around twice the data transfer rate of the original Thunderbolt protocol so these interfaces fly. Of course, their redesign takes its cue from Apple's Mac Pro, but if you're an iMac or MacBook user, these are wonderful bedfellows for your computer too. The new protocol does alienate Windows users and owners of older Macs without Thunderbolt connectivity but the sweetener here is that UA aren't discontinuing their existing Firewire Apollo interfaces, which have been reduced in price too. For those with a computer to support the capabilities of the new line-up, however, there's nothing to stop a wholehearted endorsement. They sound wonderful, Unison technology further enhances the preamp capabilities and, as ever, the onboard hosting of UAD plug-ins, in real time and with imperceptible levels of latency, provides the icing on a pretty sumptuous cake. This writer wants one.